A charter captain says he saw thousands of dead fish while taking clients out on Wednesday. "It was the largest amount of dead fish I have ever seen in my career," said Rhett Morris, of Beyond Borders Outfitters. Morris has been a charter captain for more than 20 years. "This is what makes this red tide event so scary, is these snook are getting wiped out right now and they are all full of eggs." According to the Florida Fish and Wildlife Commission, fish kills can be caused by algae blooms cutting off oxygen below the surface. 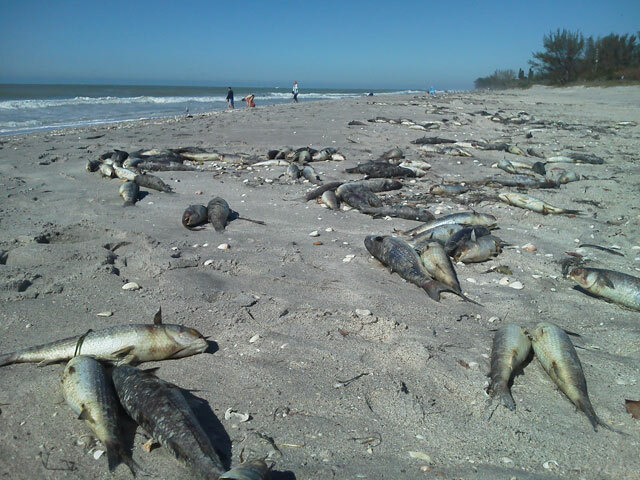 But Morris says red tide is unusual this late in the year, and they've gotten worse over the past few years. He blames Lake Okeechobee water releases, but also says Floridians are too blame, especially ones fertilizing their lawn. "As soon as we get rain, we had 13 inches of rain before the month of May ended, and that is excessive, and that flushes that top level of fertilizer straight into the water," Morris says lately some of his charter customers have come back empty handed because most of the fish are dying and he worries about what that will do to his bottom line. "I've been a full-time captain, I've never done anything else since I was 18, this all I've got, and I'm extremely concerned." Rhett also blames poor water management practices by the state for contributing to the problem. The smelly, "guacamole-thick" muck is fouling a stretch of beaches promoted as Florida's "Treasure Coast," where lawmakers and residents blame the federal government, saying the algae crisis is fueled by freshwater flows controlled by Army officials to protect an erosion-prone dyke. Three weeks after the U.S. Army Corps of Engineers began releasing Lake Okeechobee water down the Caloosahatchee River, algae bloom is advancing toward the Gulf of Mexico. The water lapping around the Alva Boat Ramp is avocado-coloured, and upriver, at the Fort Denaud Swing bridge, a 3-foot neon green ribbon extends from the bank toward the middle of the river. John Cassani of Calusa Waterkeeper says the algae has been blooming patchily in the river for the last few weeks but has spread in recent days. "There have been little blooms, but nothing like this so far," Cassani said. The river's green tinge comes from Cyanobacteria, photosynthesizing microorganisms with no cell nuclei commonly called blue-green algae. Though these organisms occur naturally in the environment, when they multiply, or "bloom," the health consequences can range from annoying to dangerous Cyanobacteria toxins can cause symptoms ranging from a runny nose to liver failure - even death, if ingested in large amounts. And it's not just human health that can suffer; the animals that live in and near water are affected as well. Too many algae can make the economy queasy, too. In 2016, when algae covered Florida's east coast and stained the Caloosahatchee, Gov. Rick Scott declared a state of emergency. Charter captains and hoteliers reported lowered bookings as some real estate professionals lost sales, blaming the foul water. This is the first widespread bloom of 2018, but Cassani had seen it coming for a while. "It was just kind of like a powder keg ready to go off," he said. "All the factors were there and then when the Corps increased the flows on June 1, and with the increasing temperature that accelerated the situation, and within the last three, four days, it's just taken off."